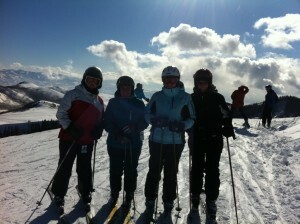 We interrupt this family ski season for…Moms’ Day Out! Now I know I am a bit competitive. Ahem. And I know that I like to push myself on the hill. But showing off? For the crowd I had assembled? Not likely. 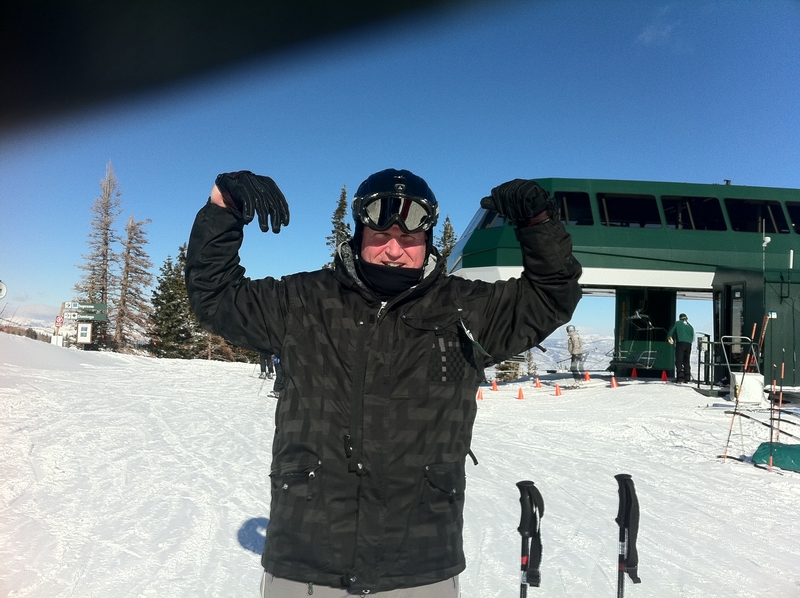 In my posse for Sunday’s adventure were a veteran former ski instructor, a friend who likes to hike the glades near her house and ski back country, and several solid intermediate skiers—myself included in that group. There was no way I could rival Lisa the hiker and Linda the vet. I could only hope to keep up. 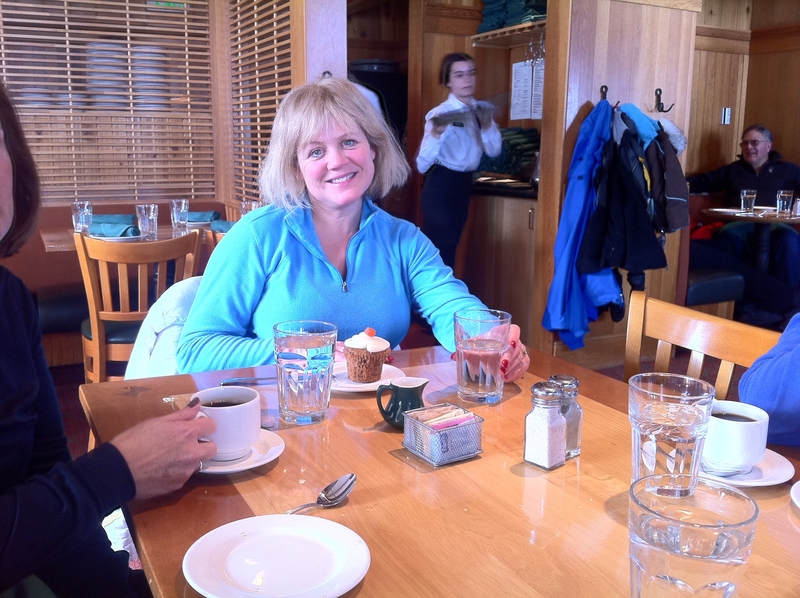 Then, Linda sat down at the Snow Park table where Ski Dad was stealing a post-ski-school drop-off cup of coffee before (sniff) catching his Vegas-bound flight for a business trip, and announced: This had better be a very social ski day—I skied waaaay harder than I planned yesterday! Ah, sweet relief. Quite soon, we were joined by Lisa and our pal Miriam, who quickly and nervously announced that she hoped she could keep up. The rest of the day—after meeting up with our friends Debbie and Donna—proved an exercise in fun. We set ourselves up with a morning at Empire. Bracing as the temperature was, the sun was shining and the snow was soft. And those in our group (cough, cough, Linda and Lisa, cough cough) who felt like stretching their mogul muscles and tree-turns were able to indulge their whim while the rest of us cruised Orion. 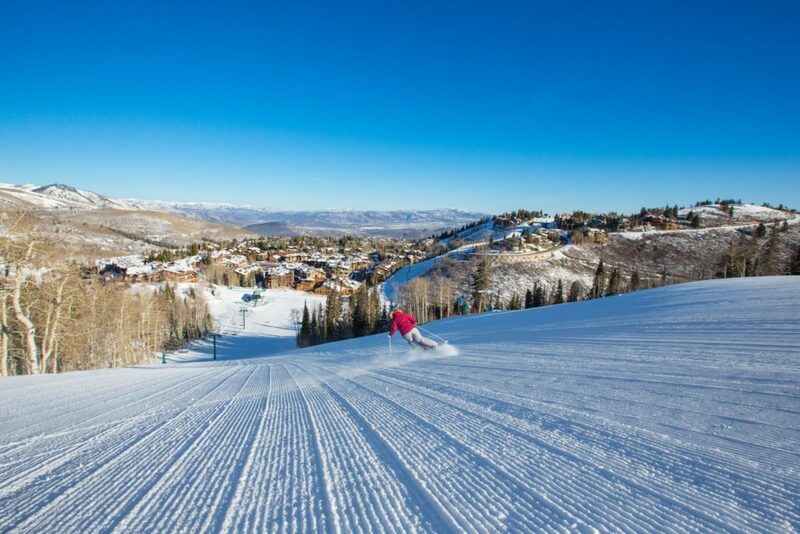 It’s one of my favorite things about skiing at Deer Valley—your party does not have to split up into entirely different parts of the mountain to suit everyone’s ability. Empire may not be the answer for every group, but there are diverse runs on almost every part of the mountain that will cater to most levels. 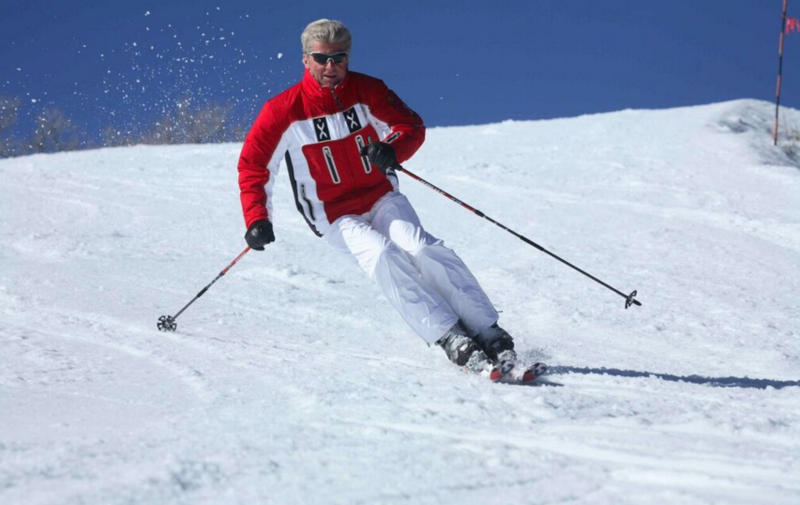 The best perk of skiing Empire in this instance was that Debbie and I had stopped in at the Rossignol Demo Center, where, for just a credit card impression (no charge) a person can check out skis for a two-hour trial. So we had a good time figuring out the ways in which the unfamiliar sticks were betraying our bad habits! stopped at our request to snap a photo. It was, I must say, one of those bluebird days that had each of us, by turns, stopping to take in every single view from various vantage points. The top of Supreme was ungroomed (a small sign warned us) and we approached the chopped up run with a bit of hesitation. Linda spoke up with wise words: “Pick one side or the other and just go!” So we did. And did not regret it. Once we settled into or seats (after resting our gear on the adjacent hearth), our doting and hilarious waiter insisted that someone at the table try the restaurant’s famous award winning Blueberry Mojito. So, game girl that I am, I took one for the team—then passed it around for everyone to sample. 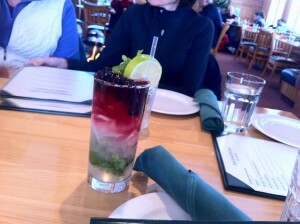 One and all appreciated the contrast of tart blueberries against sweet rum and mint. Then again, who wouldn’t? Appetizers were ordered—tuna tartare, hummus and pita chips, edamame—and the entrees were pondered. All but two of us scored the tuna tacos, while Alix enjoyed an Indian spiced vegetable Panini and Donna dug into the Asian Chicken Salad. Miriam opined that it may be best to keep the details of this lunch from her husband, who had prepared a sandwich at home in the morning to tuck into his pack for a day of skiing at another resort. Ok, Miriam, we’ll keep your secret. Darling Waiter then offered us no choice but to try the petite-but-powerful ice cream sandwiches. Lisa, in a moment of clarity, decided a carrot cupcake must be sampled as well. So, thanks to her, we did not die from a lack of variety—or vegetables—in our diet. 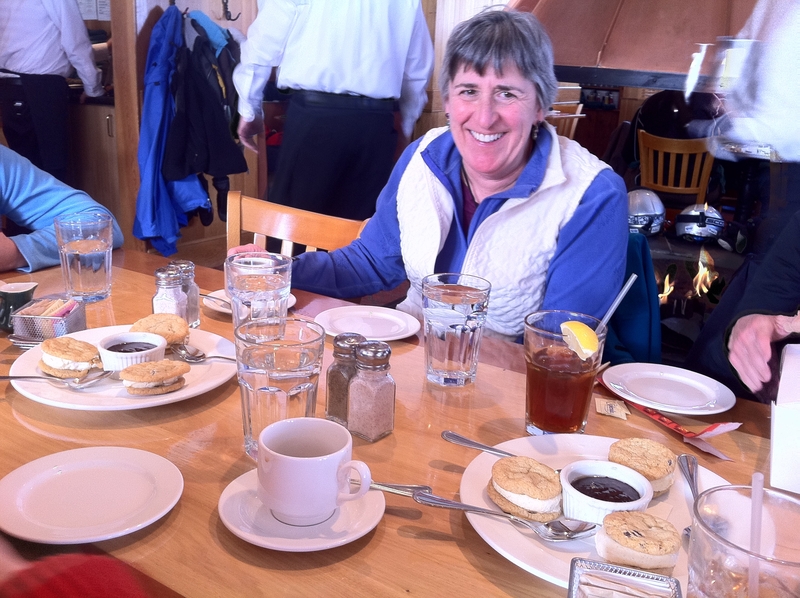 Donna remarked that she and her family had recently been at a new restaurant nearby and found themselves wishing they’d stayed at Deer Valley to eat—and that this meal only reinforced her belief that the beauty of Deer Valley lies in the combination of lovely terrain and great dining. Needless to say, it only further reinforced my “I ski for lunch” policy. Then again, I found myself rethinking that policy for just a split second as, we made our way to Flagstaff, to do an afternoon run on Lost Boulder. 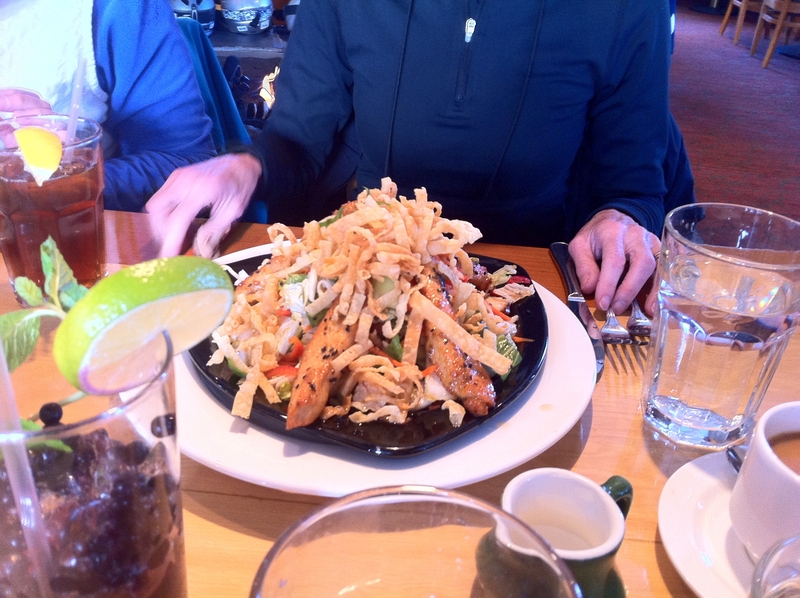 Our après-lunch legs were overmatched, to say the least. 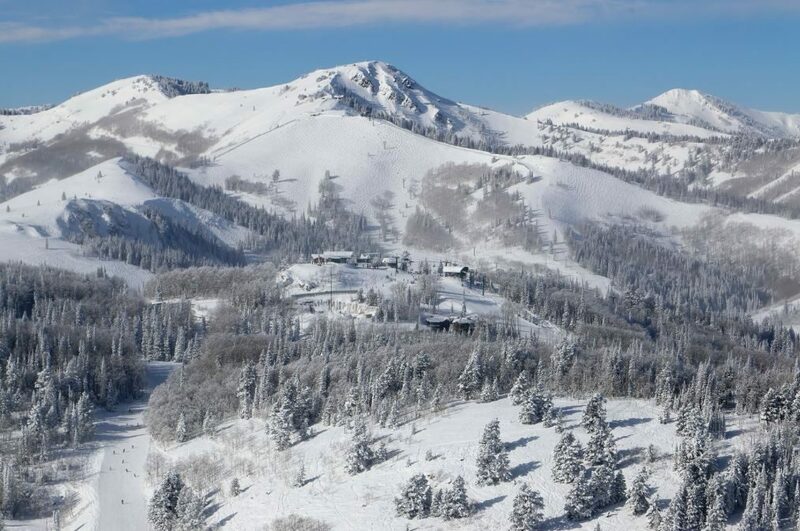 Undaunted, we worked our way over to Wasatch lift, collectively grumbled over the necessity of the steeps at the top of Bald Mountain and headed for Keno. The entire group kept stopping to rest—I mean wait for each other. We are that polite. Then it was off to Crown Point for a mellow set of turns along Kimberly to meet up with Little Stick for a lovely afternoon glide over, yep, some still-untouched corduroy. We skied down to the bottom of Wide West, at which point most goodbyes were made. Linda stuck around to say hello to Big Guy, who preceded his brother as a regular in her classroom. On the way home, the kids shared tidbits of their day—until Little Guy, true to form, fell asleep in the car just as we turned onto our block. I quickly dispensed with the gear, awoke Little Guy from his premature slumber (with visions of a 2am wakeup warning me out of letting him snooze through dinner), called Ski Dad at his hotel to confirm our intact arrival from the mountain, and beelined it to my favorite kitchen appliance: the Mac. A few mouseclicks later, dinner from a favorite pizzeria was ordered, filtered water dispensed into spill-proof cups, and aaaah, sweet sofa! 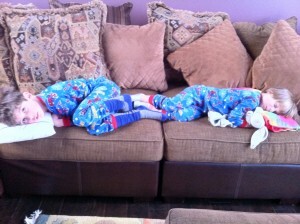 Love the passed out kids. Awesome day. 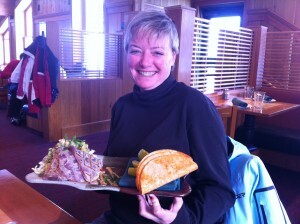 Terrific company, great skiing, but mostly double yum on the Royal Street Mojito and tuna tacos.